Is Humanism in truth its own religion? Humanism is indeed a religion. It's a religious system. In fact, back in 1961 it was declared a religion by the Supreme Court. Julian Huxley predicted that Humanism would be the ultimate religion of the world. Now, let me tell you why that bothers me. Since Humanism permeates our public schools, and because Humanism is a religion, it's fair to say that our public schools are institutions that indoctrinate our kids into a false religion. I want to be fair. We also have some great teachers that teach English and Math and a lot of good stuff. I'm not belittling them or standing against them at all. But, the fact is we've got school systems that are teaching a false religion. And, guess who's paying for it? You and me! My dollars are being used in order to support a building that is built that has false religion within its walls. I don't know if that bothers you, but it bothers me. That's one of the reasons why we need to be involved in the political process and make sure that our voice is heard when decisions are made about school curriculum. Believe me, it can be done. 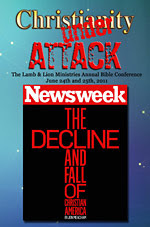 The bottom line is that Christianity indeed is in the crosshairs. So, I raise this question, will you stand with me? It's my prayer that you will. What do Humanists believe? What is this religion? What are some of the doctrines of this religion? Let's begin with the fact that Humanism is anti-supernatural. One of the books that they've come out with is Humanist Manifesto II, and it's one of the best summaries of this doctrine of Humanism. Listen to what it says, "We find insufficient evidence for belief in the existence of a supernatural. It is either meaningless or irrelevant to the question of the survival and fulfillment of the human race. As non-theists we begin with humans not God, nature not deity." Why is this beginning point so important? Well, if you begin on the premise of anti-supernaturalism, isn't that going to affect everything else you believe in? Isn't that going to set the stage for multiple denials of Christian doctrine? Yes, it is. The fact is an anti-supernatural belief is foundational to Humanism because everything else proceeds from this keeping that there is no God. James Hitchcock says in his book What is Secular Humanism? that groups like the American Humanist Association are not Humanists just in the sense that they have an interest in humanities, or that they value man over nature. It's their self definition that God does not exist. They promote a way of life that systematically excludes God and all religion in the traditional sense. Man for better or worse is on his own in the universe. Man marks the highest point to which nature has yet evolved. He must rely entirely on his own resources. Notice the phrase Hitchcock uses, "way of life." You see from the moment that they get up until the moment they go to bed, Humanism effects everything. Their denial of God affects everything. It affects the words that they speak to other people. It affects their behavior. It affects their morality, or lack thereof. It effects how they interact with the world. You see, their way of life is governed by their claim that there is no God. Isaac Asimov is a good example of this. He was a very popular writer and scientist. He once said, "Emotionally I am an Atheist. I don't have the evidence to prove that God doesn't exist. But I so strongly suspect He doesn't that I don't want to waste my time." Now, of course, Isaac Asimov is no longer an Atheist. The moment that he died he witnessed the utter calamitous collapse with perfect clarity of Humanistic Atheism. I suspect he now wishes he'd taken the time. In any event, he goes on to say, "The universe can be explained by evidence obtained from the universal alone. No supernatural agency need be called upon." In other words, Evolution explains where we all came from. Carl Sagan is another individual with the same view as Asimov. Carl Sagan actually came out with a TV series which was on PBS and followed up with a book by the same name called Cosmos. He said that, "The cosmos is all that is or ever was or ever will be." Where do you think he stole that phrase by the way, or at least part of it? It sounds kind of like the Christian doxology, doesn't it? This is the doxology that talks about the Father and the Son and the Holy Spirit who is, and whoever was, and whoever will be. It's almost like he is making the universe out to be God. But, he indicates that there is no deity with whom we need to concern ourselves. Carl Sagan is now of course no longer an Atheist. You see, the moment he died he witnessed with utter clarity the calamitous collapse of Humanistic Atheism. It is a tragic thing. God takes no delight in the death of the wicked, and neither do I. God doesn't desire any to perish. But, people have chosen the false religion of Humanism, and I must tell you, that if you go into eternity believing that religion you go into a Christ-less eternity that lasts forever. What a horrible destiny. Even our kids are taught by followers of Humanism that there is no Creator. Humanist Chris Brockman wrote a book called What About Gods? Listen to this. "We no longer need gods to explain how things happened. By careful thinking, measuring, and testing we have discovered many of the real causes of things and we are discovering more all the time. We call this thinking." What is the implication with Brockman's statement? The implication is that you and I don't think. Those Creationists guys are a bunch of nincompoops. They don't use their brains. They check their brains in at the door. They are holding on to old superstitions. They think they now know the real cause of things, and the real cause of things is Humanistic Evolution. The philosophy behind all of it is Naturalism which says that all phenomena in the world can be explained in terms of natural causes and laws. This is how one modern science textbooks puts it: "Living creatures on earth are a direct product of the earth. There is every reason to believe that living things owe their origin entirely to certain physical and chemical properties of the ancient earth. Nothing supernatural appears to be involved, only time and natural physical and chemical laws operating within the peculiarly, suitable environment." So, to Humanists, Naturalism explains everything. 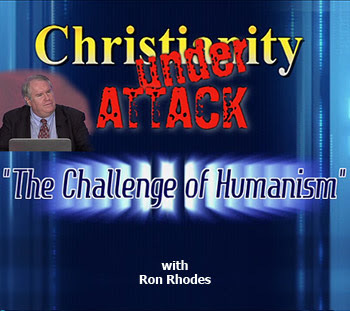 In the next part on this series with Dr. Rhodes concerning the challenge of Humanism, we'll look at its view of humanity and its source of moral values. We'll also compare and contrast Christianity and Humanism. Well, in my humble opinion, why worry, I think we can laugh along with God at their attempt to be against their creator, at best trying as they will, it's futile. preaching to those in need of Christ! !